Arcen Games, those wonderful folks behind A Valley Without Wind 2, Shattered Haven and several other indie hits, recently announced a new 4X game coming spring 2015. What's it going to be like? 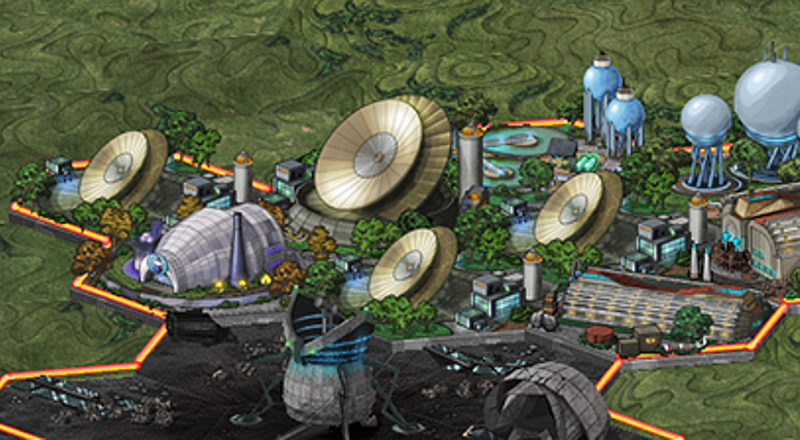 According to Arcen, "Think Civilization meets SimCity meets AI War meets New Stuff". Where do we sign? Stars Beyond Reach is a 4X strategy game, which stands for eXplore, eXpand, eXploit, and eXterminate. We know, why not 4E? Probably because it looks weird, although if you turn it on its side it kind of looks like a pelican riding a bear, which isn't weird at all. 4X games usually have deep, complex gameplay with lots of things to manage beyond units and military, things like tech advancements and economic growth. From the teaser information released so far, Stars Beyond Reach sounds like it leans more towards SimCity than Civilization in several ways. It takes place in a sci-fi world but doesn't leave the planet surface, which is why all those stars are beyond reach, right? There also aren't any units, just you and your buildings, 14 races, 8 of which are playable, 3 leader options per race, and most likely with co-op multiplayer. The team did specify "probably" with the co-op, so we can't get all mad if it doesn't make it into the final game for some reason. Most of Arcen's other games have co-op, so we're pretty hopeful. Keep an eye out for Stars Beyond Reach for PC in April/May 2015. Developer Chris Park has been answering questions on Arcen's forums, so nose your way in there for more juicy details. Page created in 1.4796 seconds.